I don't have nails to post today, although I did paint them. You'll have to wait a few weeks to see them though, as they're for a guest post on someone else's blog. In the meantime, I wanted to share the really generous and unsuspected gifts that Leslie from Polish Art Addiction gave me. I helped her make a graphic for her blog, and she was so thankful she sent me a manicure care package. I'll admit, I got a little teary when she reminded me how thoughtful and gracious people an be. Thank you Leslie, you really shouldn't have. 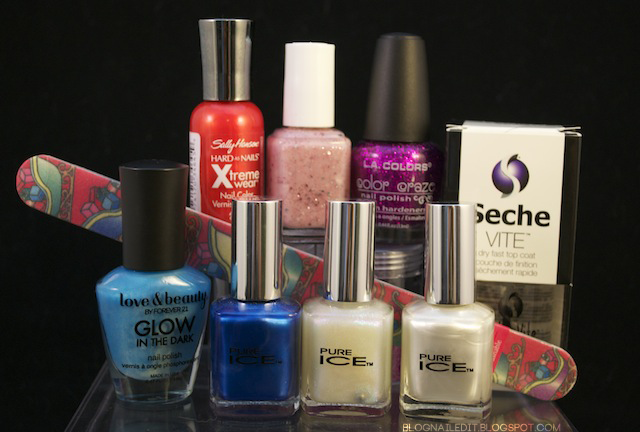 In the top row, starting on the left, is Sally Hansen Xtreme Wear Crushed, Leslie's own franken (my personal favorite of the lot), and an L.A. Colors purple fuchsia glitter. In the bottom row, from left to right, is Love & Beauty (a Forever 21 brand) Baby Blue glow in the dark, Pure Ice Celestial, Oh Baby!, and Platinum. I'm really excited about the two lighter Pure Ice colors especially. Oh Baby! seems like it may be a dupe for CND's Sapphire, and the stunning Platinum next to it is so freakin' shiny! I hope it lays well. She also included a very pretty nail file and a bottle of Seche Vite. I'm set for life now! Seriously Leslie, you're so kind for sending these gifts! I can't wait to try them all, especially your franken. It'll be perfect for Valentine's Day just around the corner. Oh wow, that is so nice!!! I still get teary when people actually do things out of the kindness of their hearts...it is rare nowadays. Nice gifts. The little help you provided may be great help for someone not so talented in a certain something. I immediately started drooling when I saw her franken (Wants!!!)!! Isn't it awesome?! I can't wait to use it!